Following on from my Inktober challenge a few months ago, I decided to grab that motivation by the horns and take part in 'Illustrated Advent', that is, to create one festive illustration per day in the run up to Christmas. Sorry, you're probably sick of snowy scenes and Christmas jumpers - but this year I allowed myself some time off and thought this was definitely worth a share post-December. In a way Illustrated Advent was a little more work than Inktober in that I was creating full colour illustrations each day (rather than a relatively quick ink painting). But, having a festive theme definitely made it easier to snap ideas to life. I did find that there's a fair bit of pressure with the festive theme, just in terms of trying to create something original, there's so so so many Christmas illustrations out there and it can be hard to create something with your stamp on it. 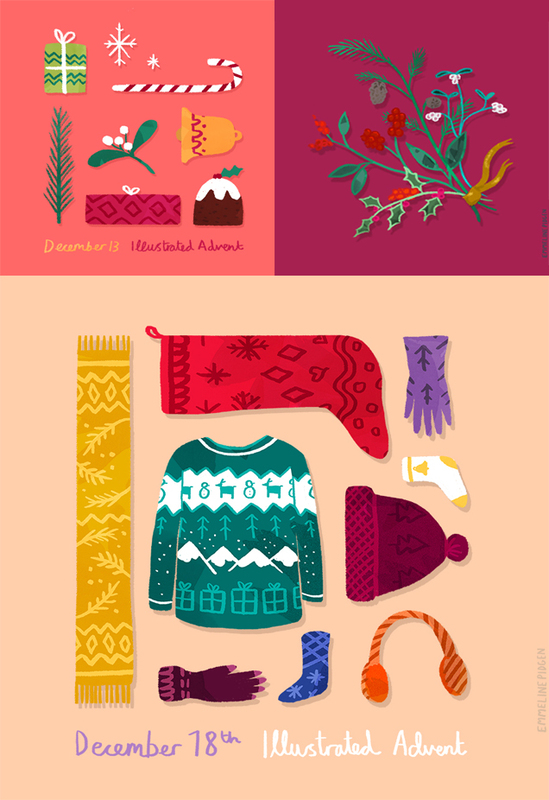 I played around with different formats of illustration: some sweet spot illustrations of snuggly animals, Wintery landscapes, characters, an animated gif for Christmas Day and these collection illustrations of festive knits, treats and foliage! I re-purposed a few of my recent Christmas card illustrations for some of the days, which allowed me to tackle some hefty deadlines I was facing with commissioned work (it's not cheating is it? Nah!). It's been great to allow myself some introspection over my work, I think it's clear from looking at the full collection that I'm very into my coral, raspberry and teal colour palettes at the moment. It's one of those things that really makes you evaluate how you're working. 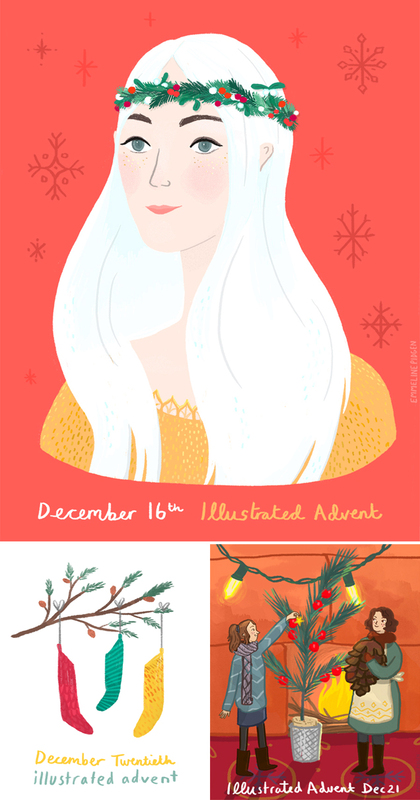 I really love some of the work I came out with through Illustrated Advent (and Inktober), so I do think it's worth taking on challenges like this, if only to force yourself to use your time productively rather than procrastinating. These drawing-a-day challenges aren't something I'm going to do all the time, it's hard to maintain a certain level of quality without burning out, and I never like the feeling of something so creative becoming a chore. But I've had a really great response to them, and you can see the full collection on Pinterest and Behance! So here we are in 2015, and I've been making a lot of plans. I have a great couple of commissions on the go (which I should be able to tell you about soon, they're bloomin' exciting!) and some serious creative goals for the coming months. Have a great start of the year! I never tire of festivity or snowy scenes. 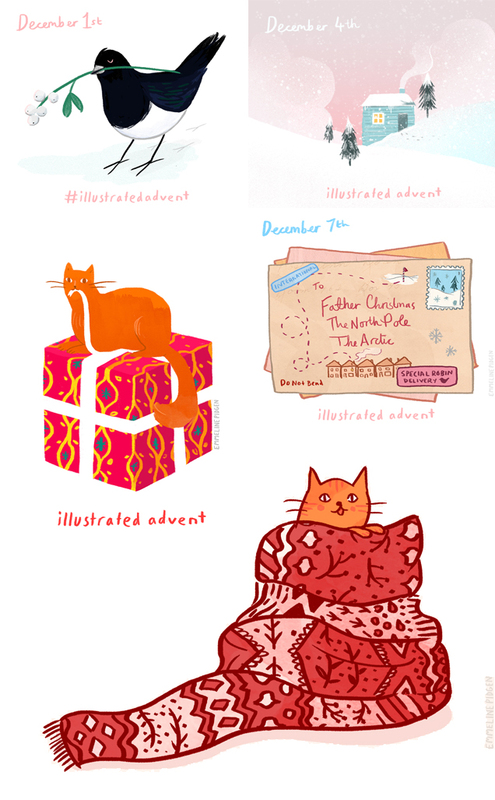 I think your Illustrated Advent is brilliant. Thanks so much for posting and for the inspiration. I love your illustrations! So cute! Do you make these mostly digitally or is there a medium you use? I started an illustration a day project on Instagram in January this year, but only after 10 days my phone broke and I will be without it until it gets fixed (up to two weeks!!!). Just my luck. But I agree with what you said: it can be challenging to maintain a certain level of standard all the time. Plus, there is always a burnout. I need to think it through when I get my phone back. Anyway, love your blog!! These were all created digitally (on Photoshop with a Wacom tablet). That's a shame about your tech problems! I think if you're going to go for a drawing-a-day project it would be best to stay away from limiting yourself to sharing it on only one platform anyway. If you pick it back up make sure you share them on Twitter, Facebook etc so that other people (like me!) who don't have Instagram can enjoy them.